The Buckeyes' vulnerable defense has a tall task ahead when they take on Clemson Tigers quarterback Tajh Boyd in the upcoming Orange Bowl. It took some time for Ohio State to get over the disappointment of not playing for the BCS national championship. The Buckeyes insist they’re now focused on the Orange Bowl. The reality of facing Tajh Boyd and Clemson’s high-powered offense with a vulnerable defense has grabbed the team’s attention. In what is shaping up to be one of the season’s more entertaining bowls, two of the nation’s most prolific offenses will be on display when seventh-ranked Ohio State and No. 12 Clemson square off in Miami on Jan. 3. Playing for the national title was the goal from the start for Ohio State (12-1), which was No. 2 in the AP preseason poll after going 12-0 in 2012 – though the team was barred from the postseason due to NCAA infractions. Led by duel-threat quarterback Braxton Miller, the Buckeyes went virtually unchallenged through the regular season and entered the Big Ten championship game second in the BCS standings. A berth in the national title game was there for the taking, but a stunning 34-24 loss to Michigan State on Dec. 7 dashed those dreams. "Obviously, we’re not going to where we thought we were going or where we wanted to be going, but we’re playing in the Orange Bowl and that’s a big-time bowl game," Ohio State offensive lineman Jack Mewhort said. "When you start going back to the coulda, woulda, shouldas, that’s poisonous for a team. It’s our job as leaders to look ahead and make sure everybody is doing their business." 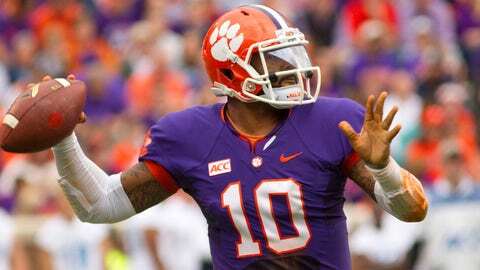 Clemson (10-2) also had national title aspirations after opening the season with six consecutive wins. The Tigers were ranked No. 3 heading into a home matchup with Florida State on Oct. 19, but were whipped 51-14 and knocked out of the BCS conversation. While Clemson struggled against the Seminoles and in a 31-17 loss to rival South Carolina in the regular-season finale, its offense has otherwise been sensational. The Tigers averaged 45.1 points and 534.6 yards in their wins, and are led by Boyd at quarterback and receiver Sammy Watkins. Boyd passed for 3,473 yards and 29 touchdowns, and he scored another nine TDs on the ground. The senior’s 102 career touchdown passes are tied for 15th in major-college history. "I’ve been watching Tajh Boyd play for many years now and I think he’s transitioned from a good player to a great player," Ohio State coach Urban Meyer said. "He’s a dynamic thrower. And as with most excellent quarterbacks, his surrounding cast might be the best in America." Watkins led the ACC with 1,237 yards on 85 catches, had 10 TDs and was named a second-team All-American. Martavis Bryant had 800 yards and five scores on 39 receptions for an average of 20.5 yards per catch – one of the nation’s highest marks. As teams have tried to gameplan to stop Boyd and the passing attack, holes have opened up for running back Roderick McDowell. The senior rushed for 510 yards and five touchdowns, and had another two receiving scores in the final five regular-season games. 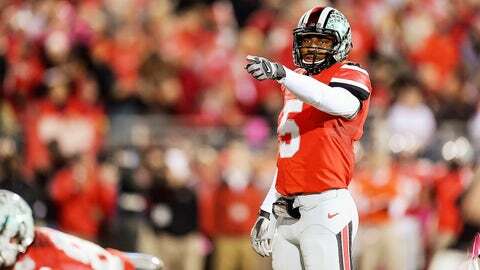 "They have a lot of good athletes," Ohio State All-American linebacker Ryan Shazier said. "This might be the best passing team we’re going to face this whole season." That could spell trouble for the Buckeyes given their recent problems against the pass. Ohio State allowed its last four opponents to complete 63.7 percent of its passes for an average of 340.8 yards and 11 total TDs. The Spartans’ Connor Cook, who came in averaging 176.6 yards, threw for a career-best 304 yards and three scores. Meyer said personnel changes on defense are possible with freshmen Tyvis Powell and Vonn Bell seeing more playing time in the secondary. While Clemson’s offense presents significant challenges, Ohio State has also piled up the points this season. The Buckeyes ranked fourth in the FBS in scoring at 46.3 points per game and seventh in total offense, averaging 518.5 yards. Most of the damage comes on the ground with Miller and running back Carlos Hyde powering an offense that averaged 317.5 rushing yards – the nation’s third-best mark. Miller, the Big Ten offensive player of the year, averaged 155.8 rushing yards per game, 9.4 per carry and ran for eight TDs over his last four contests. He also led the Big Ten with 22 passing touchdowns while throwing for 1,860 yards. The junior, who may forego his senior season for the NFL, is hoping to redeem himself on another big stage after going 8 of 21 for 101 yards and a score in the Big Ten championship game. He has completed less than 50.0 percent of his passes in three of the last four contests. Hyde, a third-team All-American, was second in the Big Ten with 14 rushing touchdowns despite missing the first three games due to a suspension. In the last six contests, he rushed for 965 yards with an average of 8.7 per attempt. "Miller and Hyde are as good a combination of quarterback and running back as there is," Clemson defensive coordinator Brent Venables told the school’s official website. "They have power and speed. "This will be our greatest challenge physically this year." The Tigers have had trouble stopping the run, allowing an average of 169.5 rushing yards in their last four games, but have been solid against the pass, yielding an average of 132.3 yards and two total passing TDs over that same span. Defensive end Vic Beasley was among the nation’s leaders with 12 sacks, and Mewhort, a third-team All-American, draws the difficult assignment of matching up against him. 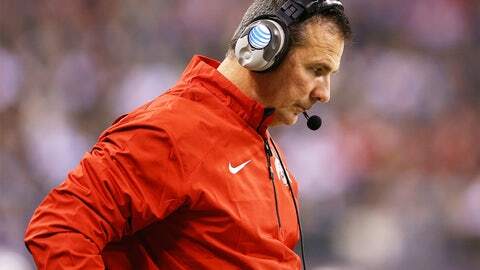 "We’re really going to have to play our tails off to move the ball against them," Meyer said. The schools have met only once before, with Clemson winning 17-15 in the 1978 Gator Bowl. That game is most remembered for Ohio State coach Woody Hayes punching Clemson’s Charlie Bauman after he intercepted a late pass. Hayes was fired the next day. The Buckeyes won their only previous Orange Bowl appearance in 1977, beating Colorado. Clemson is making its fifth trip to the Orange Bowl, but doesn’t have fond memories of its last one. Two years ago after winning the ACC title, the Tigers were embarrassed 70-33 by West Virginia.